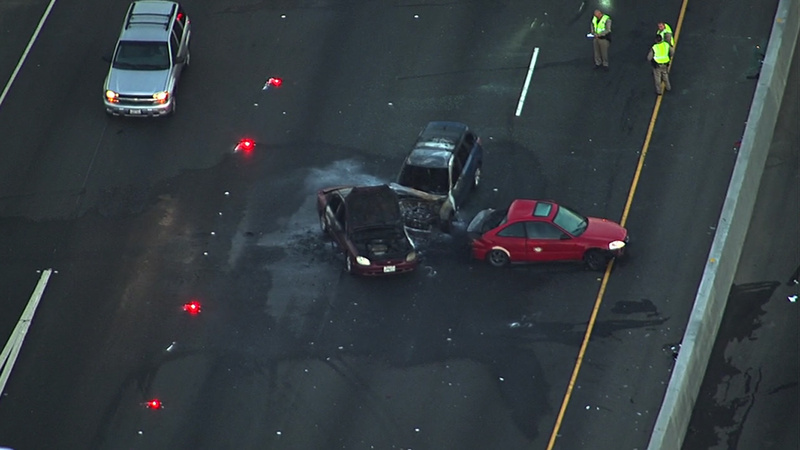 OAKLAND, Calif. -- All lanes have reopened on southbound Interstate Highway 880 after a four-car crash left one person dead this morning, a California Highway Patrol spokesman said. The crash was reported at about 4:50 a.m. on southbound Highway 880 near High Street. Officers responded and found four vehicles at the scene, two of which were engulfed in flames, CHP Officer Sean Wilkenfeld said. try to avoid the stalled Hyundai and came to rest sideways in the far left lane, Wilkenfeld said. A 52-year-old San Francisco man driving a 2010 Subaru Forester then struck the Honda, which was also hit by a 2005 GMC 1500 driven by a 42-year-old Vacaville man, according to Wilkenfeld. The driver of the Honda was killed in the crash. Her name is not yet being released by the Alameda County coroner's bureau. The driver of the Subaru was taken to the hospital with minor injuries. His car and the Hyundai were the vehicles on fire when officers arrived, Wilkenfeld said. The crash shut down multiple lanes of the highway for more than two hours. All lanes reopened as of shortly before 7:30 a.m., according to the CHP. All of the drivers cooperated with the investigation into the crash and no arrests were made, Wilkenfeld said.